Today Richard and I made Moroccan Preserved Lemons. He saw them somewhere and wanted to make them, so we tried. I’m not sure that I’m going to like these since the mixture of lemons and garlic doesn’t appeal to me unless chickpeas are involved, but they do look pretty! 1. Prepare a clean glass jar with a cover that is large enough to hold the lemons (e.g. 8-cup capacity). 2. Cut the lemons into quarters lengthwise, without cutting all the way through. They should be attached at one end, and stay in one piece. 3. Stuff each lemon with 2 Tbsp kosher salt. Make sure to use kosher salt, not table salt. 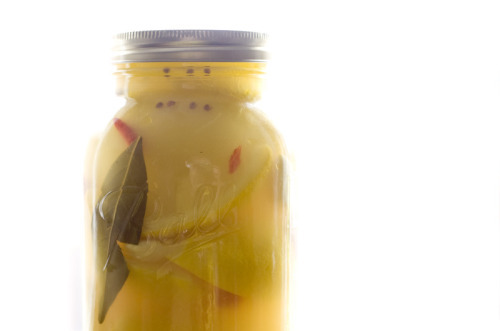 Put the stuffed lemons in the jar. (We also added some red peppers, bay leaves and garlic). 4. Cover the jar, and keep it at room temperature for a week. Every day or two, press the lemons down to get some juice out of them. Depending on the shape of your jar, this can be done with a plate, a potato masher or a clean hand. 5. After a week, the lemon juice should almost cover the lemons. Pour in enough olive oil to cover the lemons, and refrigerate for 3 weeks before using. Lemons will keep in the fridge for up to 6 months. Expect that the oil may solidify and a white film may form on top of the lemons. It’s normal. 6. To use, remove lemons from the jar with tongs, and rinse them well under cool water.